Giving competitors like GoDaddy a run for their money in the marketing and advertising department, HostGator’s quirky TV commercials and alligator mascot have done much to keep the company in the public spotlight. Yet behind all the hype, it’s the Houston, Texas based company’s commitment to delivering enhanced performance and superior features that has kept them at the forefront of the shared hosting industry for over a decade. One of the biggest challenges in getting the absolute best deal on a shared hosting package is simply getting to the right company on the right day. Just two days ago, as I was gathering my notes and preparing an outline of this review, the cost of the HostGator Baby plan was £3.25 per month (I even had the screenshot graphic with that price ready to go live). Today, as I sit down to actually talk about the service, I find that has increased by just over one US Dollar. What I’m getting at here, is that companies like HostGator do have a habit of shifting their prices up and down, so it often pays to keep an eye on things and shop around in order to get the most for your money. 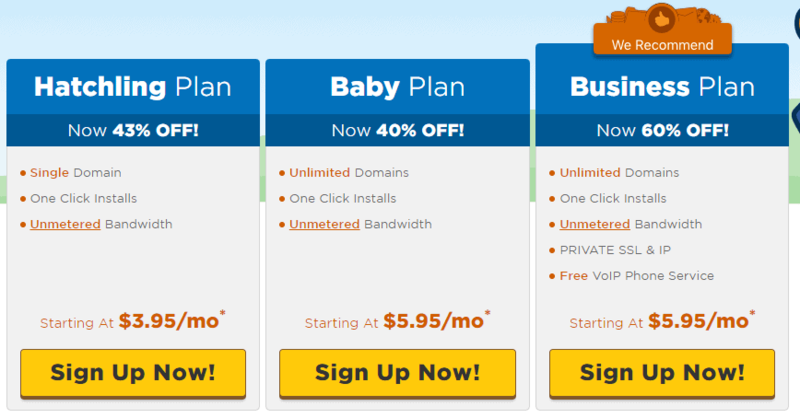 I chose to review the Baby Plan primarily to make a fair comparison with the unlimited hosting plans offered by other companies, all of which provide support for multiple websites and unlimited domains. That said, if you’re only planning to launch a single website, you might be better off saving a bit of money and opting for the lower-cost Hatchling Plan, which also provides unlimited storage and bandwidth though only supports a single domain name. There’s a lot to like about HostGator, but unfortunately, the cost of their domain names isn’t one of them. Most of the big brand shared hosting providers incorporate a free top level domain name (.com, .org, .net etc) into their plans. Some make the domain free for the lifetime of your account, some give you just a year or a single contract term before you have to start paying for your website address. HostGator, unfortunately, do neither. Instead, if you want to set up a new domain name your hosting plan, you’ll need to pay at least $12.95 for your first year, and then $15 to renew it every year thereafter. Of little consolation here is that, if you already own a domain name that you registered elsewhere, you can bring this into your HostGator account free of charge. As disappointing as it may be to find that there’s no freebie with the HostGator Baby plan, there is at least some good news in the sense that the company don’t have any restrictions on how many sub, addon, and parked domains you can use with your account. In terms of general user-friendliness and ease of use, I’ve had good and bad experiences with HostGator, and generally found that some tasks are a lot simpler than others. Let’s get the bad stuff out of the way first. One of the more frustrating things I’ve had to do with HostGator is just managing my account. With pretty much every top company I’ve come across, one single login is required for one single platform where you can do everything from changing your billing address and paying your hosting renewal fees to setting up a new WordPress website or setting up a subdomain. HostGator do things differently, with one billing login for general account administration and a second for accessing your control pannel and managing your website. Whilst I can see the argument that this is perhaps better for account security, I can also argue that I’ve never had any security issues with those hosting companies who only require a single login. Ultimately, this approach just makes using your HostGator account more time consuming than it needs to be, and can be frustrating at times, especially since HostGator’s billing management system isn’t the most intuitive I’ve ever come across. Thankfully, what the company get wrong in terms of account management they do make up with the overall simplicity of their website management controls. The company opts for cPanel which is as easy to get to grips with many other providers use like BlueHost and iPage. Here, priority is given over to the more frequently used icons such as application installations and email management. These generally feature right at the top of your control panel, with those icons you select from further down moving to the top for faster, more efficient use. Billing aside then, I have found HostGator relatively easy to use, and whilst intermediate and advanced users can take advantage of the more sophisticated options available, beginners should have no problems in navigating their way around the dashboard, using most of the more common tools, and ultimately getting their new website off the ground. I mentioned earlier that superior uptime and performance was one of my main reasons for still using HostGator for certain types of sites despite the higher price tag. As part of their customer guarantee, the company promise at least 99.9% uptime, and my own server monitoring tests (see the chart to the right of this review) confirms that they pretty much always deliver what they promise. In terms of speed and performance, I’ve found that even a large, high powered online store I launched on the platform returned page load speeds which dwarfed those of some of HostGator’s competitors, whilst the overall performance makes this one a good option for anyone expecting higher than average traffic levels. As with most good hosting providers, HostGator has multiple options for building and launching a website, meaning that users of all different levels can find a tool to create their site that matches their level of skill and technical know-how. If that’s a little too technical than what you’re looking for, you might be pleased to note that the one-click application installation from your cPanel makes it simple to launch both major CMS platforms and niche tools alike. WordPress, Joomla, Drupal, and Magento are all fully supported here, as Moodle, phpBB, and software to help you create wikis, forums, blogs, portals and other types of website, usually by doing nothing more technical than loading up the tool and configuring the various options to meet your requirements. If all this still sounds like it may be just that little bit too tricky, the inclusion of a free weebly website builder may be just the thing you’re looking for. One of the most highly praised drag-and-drop website building tools on the net, Weebly requires no technical skill or expert knowledge to create functional, beautiful looking websites. Instead, the tool allows you to load one of several hundred pre-designed website templates, and customise it as much -or as little- as you like, by changing everything from the colour scheme and typeface to the layout and features. This is all done by dragging various items around the screen with your mouse, and using simple-to-navigate menu options to make changes. Weebly is becoming an increasingly more prevalent tool in the shared hosting industry, with a number of HostGator’s competitors also bundling it into their plans. There’s a good reason for this too, it’s one of the easiest and most effective ways to create a great looking website, and means that those of you new to owning a website can get just as much out of your HostGator plan as those who’ve been doing it for years. A quick word of caution: If you’re based in the UK (or indeed anywhere outside North America or India), don’t let HostGator’s promise of $200 in search engine advertising credits draw you in. The company promises $100 vouchers for both Google AdWords and the joint Yahoo!/Bing advertising network, though sadly these are only available to customers in the US and Canada, whilst those in India can take advantage of a similar -albeit slightly reduced- offer. The good news at least, is that the company’s shared hosting plans do include a number of tools and features through one click installation that can help you track website usage, plan and distribute email marketing campaigns, and enhance the Search Engine Optimisation of your website for better results with search engines like those mentioned above. Not perfect then, though in fairness I’m finding recently that less and less companies are offering the kind of marketing suites that they used to, especially for UK customers, so this isn’t quite the blow that it may first seem to be. Much as with competitors such as GoDaddy, HostGator are at their best for eCommerce when you upgrade to the top level Business plan. Though all for their shared hosting solutions provide integrated support for shopping carts like CubeCart and osCommerce, along with one-click Magento installation and PayPal support, the Business Plan goes well above and far beyond these industry standard basics. Currently priced with a 20% discount for a total cost of $11.96 per month, HostGator Business is one of the only shared hosting solutions I’ve seen which not only includes a private SSL for data encryption, but actually goes all out to include a free dedicated IP address. Even better, there’s the option to still buy the Baby Plan (which does come with Private SSL in the price) but spend as little as $2 per month on a dedicated IP. With many of HostGator’s rivals charging around £100 per year for tools like this, this is especially good value. A vital component of safe, secure, and ultimately successful online stores, this was originally something I was very surprised to see from such a competitively low priced shared hosting solution, and is the main reason I always recommend HostGator to my own clients who come to me for eCommerce website development. I sometimes feel like describing a particular part of a hosting company’s overall service as ‘average’ is something of a cop out, but when it comes to HostGator’s customer service, that really is the best way to describe it. The company do get a lot of things right, particularly in offering 24/7 support via live chat, phone and email and are friendly and professional enough without ever doing much to warrant any kind of high praise. In my own personal experience, I’ve actually found phone support to be the quickest method of getting through to somebody, with live chat operators often taking longer to respond than many of their contemporaries at other hosting companies. Knowledgebase articles, tutorials, and how-to guides are sufficient and easy enough to understand, though again, they don’t particularly do anything outstanding. Still, I do have to admit that even average service is still better than some of the reasonably poor efforts put forth by other providers (GreenGeeks spring immediately to mind), and for that reason I’m going to give HostGator a decent score on the customer service front. Throughout my hostgator review I’ve tried to outline both the advantages and disadvantages from my personal experience. With the additional cost of a domain name putting HostGator’s already relatively high hosting fees at the top end of the scale, this isn’t necessarily a company I’d recommend for those looking to build small, simple websites on a budget. Rather, I find that HostGator are far better suited to those who will benefit from features such as enhanced performance, free SSL use and low-cost dedicated IPs to build powerful, dynamic online stores and other large (in terms of file size, traffic levels, or both) web projects. The company is always one of the first I turn to for my own larger projects, though I can certainly see an argument for using a lower cost unlimited plan for those with less advanced needs.